Time really does fly much too fast. 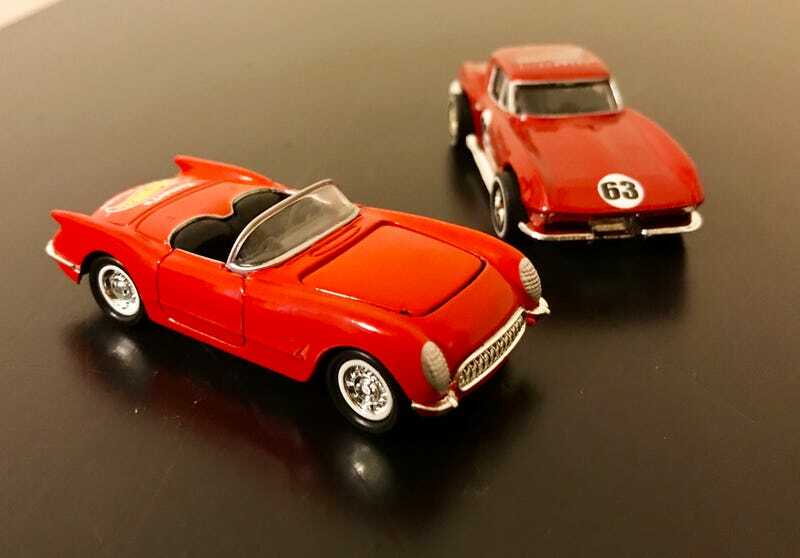 These little red Corvettes have been collecting dust at my parents’ house for a decade. I figured it was time to set them free. I got them when I went through my collector phase as a teenager. I guess when I transitioned from “Toys!” to “eBay!” As you can see, they’re special editions that are worth about half what I probably paid for them at the time. The 53 Convertible is one of the few (if not only?) non-100% 53 Corvettes HW ever made. I assume it was some sort of mail-in offer through Tomart’s. It mostly lives up to the quality I would expect from a special edition. The wheels aren’t Real Riders but they still look impressive. Not sure that style has been used on anything else. The base is metal but feels light. It doesn’t have the heft of more recent metal-based diecasts, like my Cool Classics 55 Corvette. It has an opening hood with a chromed plastic engine, which is nice. And while it would have been great to have the trim pieces down the sides chrome painted, having chrome bumper pieces is a rare treat in HW’s takes on the C1. The 1963 is much closer to its mainline sibling, all the way down to the poorly sized axles and tires for the narrow body (they stick out like the car was supposed to have fender flares or something). At least it has a nice set of Real Riders. The exterior metal flake-ish paint is good and the detail paint on the windows and taillights is nice. The tampo’d badges are well done as well. However the cast itself – like the mainline – is what I would consider OK. The headlight and door cuts are barely visible under the thick gloss (the less glossy mainline has the same problem) and the C2s sharp curves seem almost muted – a bit like the 1970s Corvette Stingray cast. These small quibbles aside, they do look good and the recent reunification has made them welcome additions to my office fleet. Plus, I’m a little partial to red Corvettes.